Spain is a country in Southern Europe . It is in the Iberian Peninsula. Spain is bordered by France,Portugal and Andorra. In Spain's northeast side are the Pyrenees mountains. The people of Spain are called Spaniards. They speak Spanish (in Spanish, "Caste llano", from Castillo, or "Espalier"). They speak other languages in some parts of the country. They are Catalan, Basque, and Galician, Leonese, Aragonese, Aranese Occitan and even Portuguese. The religion of most of the people in Spain is Roman Catholic. Since 1975, Spain has had a constitutional monarchy. The King of Spain is Felipe VI he only does what the constitution allows him to. The parliament is called Las Cortes Generals, and has two bodies: EL Congress" (The Congress) and "El Sen ado" (The Senate) and it is chosen by the Spanish people by voting. The Prime minister is Pedro Sánchez. The government and the king's palace are in Madrid, the capital of Spain. Spain has more than five hundred thousand square kilometres of land. It is smaller than France, but it is bigger than Germany. Almost fifty million people live in Spain. 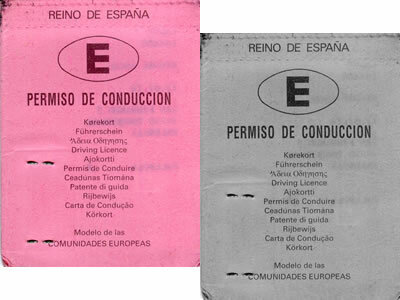 Spain has 17 parts called autonomous communities (this means that they can decide upon some affairs themselves). Each part has its own government. People have lived in Spain since the Stone Age. Later, the Roman Empire controlled Spain for about five hundred years; then as the Roman Empire broke up, groups of Germanic people including Visigoths moved in and took control. In 711, the Umayyads took over, and later groups from North Africa, called the Moors. At first the Moors ruled most of Spain but the reconquista slowly forced them out over seven centuries. They called the land Al-Andalus. They were Muslims, and Muslim Spain was the farthest western point of Islamic civilization. The Caliphate of Córdoba fell apart in the early 11th century and Muslim rulers sometimes fought each other when they weren't fighting the Christians. Muslim Spain was focused on learning. The greatest library system outside Baghdad was also there. The Kingdom of León, the most important in the early Spanish Middle Ages, was born in 910. This Kingdom developed the first democratic parliament (Cortes de Llión) in Europe in 1188. After 1301, León had the same King as the Kingdom of Castile in personal union. The various kingdoms remained independent territories until 1833, when Spain was divided into regions and provinces. In 1492, the Christians took the last part of Spain that still belonged to the Moors, Granada. Boabdil, the last Moorish King of Granada, surrendered to King Ferdinand II of Aragon and Isabella I of Castile on 2 January 1492. Ferdinand and Isabella now ruled all of Spain. Before this, there were a number of Christian countries in what is now called Spain. Two of these countries, Castile and Aragon, came together when Ferdinand II of Aragon married the queen Isabella of Castile. The King ruled as much as the Queen. Inside of the Mezquita in Córdoba, a Muslim mosque which became a Christian cathedral. In the same year, 1492, they sent Christopher Columbus to sail across the Atlantic Ocean. Columbus found the islands of the Caribbean Sea. When other Europeans explored, like Hernán Cortés and Francisco Pizarro, they found out that there were two continents there - North America and South America. Spanish conquistadores took over very large parts of those two continents. This empire did not make Spain a rich country, for most of the money had to be spent in wars in Italy and elsewhere. Some of these wars were fought against other European countries who were trying to take over parts of the Americas. Meanwhile, at home, the Muslim manuscripts had been either burnt or taken to other countries. Jews had also been expelled from Spain. Some Jews remained but they had to become Christians. Among the few old things kept and respected in Spain were in music: harmony and stringed instruments. The buildings that had been built by the Moors were kept, and many Muslim religious buildings (mosques) were turned into churches. Some Jewish religious buildings were also turned into churches. Many Arab words became part of the Spanish Language. The grandson of Ferdinand and Isabella was Charles. When his grandfather died he inherited Castille and Aragon. He also inherited many territories at the death of his other grandfather, Maximilian I of Austria. Charles received from Maximilian the Austria state and the territories of Burgundy. He was named Charles I in Spain, but he was elected as the emperor of the Holy Roman Empire, and was called Charles V, Holy Roman Emperor. This made the empire bigger than ever. However, it was not a single country, but a personal union of many independent countries with a single King. At first many Spaniards did not want Charles as their king, so they fought against him. However, he won. Charles did not like the Protestant Reformation, and fought against it. In the 18th century some of the parts of that large empire became their own countries, or were taken over by new countries, such as the United States of America. Spain (and other European countries) was invaded by Napoleon of France. Britain sent troops to defend the peninsula, since it was so weak. Most of the Spanish Empire became independent in the following decades. There was not much peace in Spain during the first part of the 20th century. Some Spaniards tried to set up a government chosen by the people (a democracy), and they made Alfonso XIII leave the country. However, in 1936, two different groups of Spaniards went to war over whether the government should be a democracy, in the Spanish Civil War (although those on the side of the Republic were largely socialist or anarchist), or take orders from one person. In 1939, those who wanted democracy were defeated, and a nationalist dictator named Francisco Franco took over the government. Francisco Franco died on 20 November 1975. He had decided that Spain should have a monarchy again, and he chose Juan Carlos, the grandson of Juan of Bourbon who had been forced to leave the country, to be king and Adolfo Suárez to become its first Prime Minister. But the king and Suárez did not rule as a dictator; instead, they chose to set up a democracy. On 23 February 1981 a group of people who had supported the now dead General Franco tried to take control of the democratic Spanish Parliament by force, they entered the building and fired guns in the air. It was seen live on Spanish television and there was widespread fear that this might be the start of another civil war. However, Juan Carlos I, quickly appeared on television and broadcast to the nation that they should remain calm. The persons responsible for the attempt to take over the country were arrested. Now Spain is a modern democratic country, and does business with many countries around the world. It is the eighth largest economy in the world and is an important part of the European Union. On 2 June 2014, Juan Carlos I announced that he would abdicate in favour of his son, Felipe VI. The date of abdication and handover to Felipe occurred on 19 June 2014. He and his wife kept their titles. Ancient religions in Spain were mostly pagan. Today, however, at least 68 percent of Spain is Roman Catholic. Spanish mystic Teresa of Ávila is an important figure within Catholicism. 27 percent of Spaniards are irreligious. 2 percent are from other religions, this include Baha'i Buddhists, Jain, Muslim,Unitarian Universalism and Zoroastrianism. The middle of Spain is a high, dry, flat land called La Meseta. In La Meseta it can be very hot in the summer and cold or very cold in the winter. Spain also has many mountain ranges. The Mount Teide (Tenerife, Canary Islands), the highest mountain of Spain and the islands of the Atlantic (it is the third largest volcano in the world from its base). In the north there is a range of mountains called Los Picos de Europa (The European Peaks). Here it is very cold in winter with a lot of snow but with gentle warm summers. In the south-east of the country is a range of mountains called La Sierra Nevada (The Snowy Mountains). This range of mountains contains the highest mountain in mainland Spain, Mulacen, at 2952 metres. La Sierra Nevada is very popular in winter for winter sports, especially skiing. Snow remains on its peaks throughout the year. The south coast, has a warm and temperate climate, not very hot or very cold. Since Spain is in the south of Europe, it is very sunny. Many people from Northern Europe take their vacations in Spain, enjoying its beaches and cities. Spain has a border with Portugal in the west and borders with France and Andorra in the North. In the south, it borders Gibraltar, a British territory. The Spanish territories of Ceuta and Melilla are in North Africa and border onto Morocco. Spain is divided into Autonomous Communities, which means that they have their own regional governments. They are Andalucía (capital city Seville), Aragon (capital city Zaragoza), Asturias (capital city Oviedo), Balearic Islands (capital city Palma de Mallorca), Basque Country (capital city Vitoria), Canary Islands (capital cities Santa Cruz de Tenerife and Las Palmas), Cantabria (capital city Santander), Castilla-La Mancha (capital city Toledo), Castile and Leon (capital city Valladolid), Catalonia (capital city Barcelona), Extremadura (capital city Merida), Galicia (capital city Santiago de Compostela), La Rioja (capital city Logrono), Madrid Community (capital city Madrid), Murcia Community (capital city Murcia), Navarra (capital city Pamplona) and the Valencia Community (capital city Valencia). 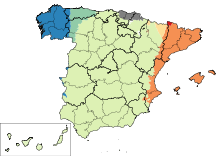 While Spanish is the most spoken language in the country, other languages like Catalan, Basque or Galician are also spoken in a few territories. ↑ Presidency of the Government (11 October 1997). "Real Decreto 1560/1997, de 10 de octubre, por el que se regula el Himno Nacional" (PDF). Boletín Oficial del Estado núm. 244 (in Spanish). ↑ "The Spanish Constitution". Lamoncloa.gob.es. Archived from the original on 25 March 2013. Retrieved 26 April 2013. ↑ Centro de Investigaciones Sociológicas (Centre for Sociological Research) (October 2017). "Barómetro de septiembre de 2017" (PDF) (in Spanish). p. 41. Archived (PDF) from the original on 28 September 2017. Retrieved 13 October 2017. ↑ "Anuario estadístico de España 2008. 1ª parte: entorno físico y medio ambiente" (PDF). Instituto Nacional de Estadística (Spain). Retrieved 14 April 2015. ↑ "Cifras de Población a 1 de julio de 2016. Estadística de migraciones. Primer semestre de 2016. Datos Provisionales" (in Spanish). Instituto Nacional de Estadística (INE). 16 December 2016. ↑ 7.0 7.1 7.2 7.3 "Spain". International Monetary Fund. Retrieved 8 May 2017. ↑ "Gini coefficient of equivalized disposable income (source: SILC)". Eurostat Data Explorer. Retrieved 8 September 2017. ↑ Goodman, Al; Mullen, Jethro; Levs, Josh (2 June 2014). "Spain's King Juan Carlos I to abdicate". CNN. Retrieved 2 June 2014. ↑ "Spain will have two kings and two queens". Retrieved 18 June 2014. ↑ "Centro de Investigaciones Sociológicas (Centre for Sociological Research) (October 2017). "Barómetro de septiembre de 2017" (PDF) (in Spanish). p. 41. Archived (PDF) from the original on 28 September 2017. Retrieved 13 October 2017" (PDF). 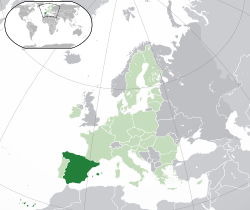 Wikimedia Commons has media related to Spain. ↑ The Spanish Constitution does not establish any official name for Spain, even though the terms España (Spain), Estado español (Spanish State) and Nación española (Spanish Nation) are used throughout the document. Nonetheless, the Spanish Ministry of Foreign Affairs established in an ordinance published in 1984 that the denominations España (Spain) and Reino de España (Kingdom of Spain) are equally valid to designate Spain in international treaties. The latter term is widely used by the government in national and international affairs of all kinds, including foreign treaties as well as national official documents, and is therefore recognised as the official name by many international organisations. ↑ The official Spanish language of the State is established in the Section 3 of the Spanish Constitution of 1978 to be Castilian. In some autonomous communities, Catalan 20%, Galician 5% and Basque 2% are co-official languages. Aragonese, Asturian, and Occitan (locally known as Aranese) have some degree of official recognition. ↑ As of July 2016, Spain's population was 46,468,102. In the same month the number of citizens with Spanish citizenship reached 41,996,253. The number of foreigners (i.e. immigrants, ex-pats and refugees) permanently living in Spain was estimated to be at 4,426,811 (9.54%) in 2015. ↑ The Peseta before 2002. ↑ The .eu domain is also used, as it is shared with other European Union member states. Also, the .cat domain is used in Catalan-speaking territories, .gal in Galicia and .eus in the Basque-speaking area. ↑ European Union (EU) since 1993. This page was last changed on 12 April 2019, at 20:36.